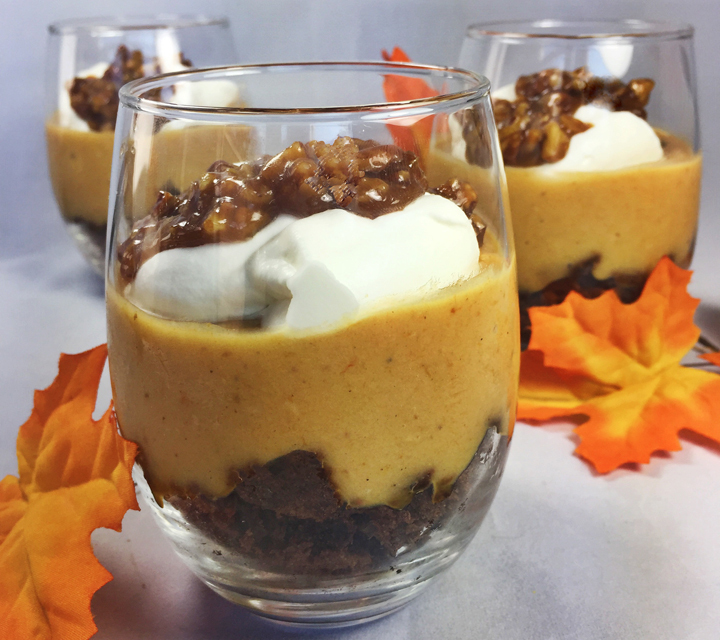 Our layered dessert starts with a delicious chocolate brownie base, followed by pumpkin pudding and topped with soft whipped cream and caramel pecans. It’s a quick and easy dessert, that’s the perfect finish for any fall dinner or on your Thanksgiving dessert table. Preheat the oven to 350 degrees. Place the pecans on a small sheet tray and toast for 8-10 minutes until lightly browned. Remove from the oven and set aside to cool. Place a large size bowl over a bigger bowl filled with ice; set aside. Combine the pumpkin puree with the pumpkin butter and salt in a medium bowl and whisk until well combined; set aside. In a separate medium-size bowl, add the egg and milk together and mix until thoroughly incorporated; set aside. In another medium bowl, whisk together the sugar and cornstarch. Slowly add the egg and milk mixture to the sugar/cornstarch mixture, whisking the entire time. Pour into a large saucepan set over medium heat. Continue to whisk while bringing the mix to a boil; then whisk for one minute longer. Remove from the heat and whisk in the vanilla extract. Then add the pumpkin mixture to pan, continually whisking, until thoroughly blended. Pour into the bowl set over the ice-filled bowl. When cooled, cover, place in the refrigerator, and chill for at least 4 hours or overnight. Place the cream in a bowl and using a mixer fitted with a whisk attachment, whip until very soft peaks form. Sprinkle the confectioner’s sugar over the cream and continue whipping until stiff peaks form. Set in the refrigerator to keep cold. Place the caramel in a small saucepan. Heat on low until softened and smooth. Stir in the toasted pecans and remove from the heat. Crumble the brownies into small pieces. Fill six 12-ounce serving cups with the brownie pieces, pushing them up on the sides to make an indent in the middle. Divide the pudding between the cups and fill ⅔ full. Top with a dollop of whipped cream and the caramel nuts; serve immediately. Makes six servings.